On Feb 1st, BioVirtua graduated from the Nex Cubed incubator program as one of the startups in their 2017 Fall Cohort. Nex Cubed focuses on startups which use artificial intelligence, machine learning and frontier technology to solve real-world problems. BioVirtua is solving a real need in the healthcare industry by improving the quality, cost, and timeliness of in-person and remote healthcare encounters using machine learning and artificial intelligence to quantify human movement. The four-month long incubator program concluded in an evening of networking with investors and industry professionals, showcasing of products by the graduating companies and demo pitches by the founders of the startups. The presentations started with the Nex Cubed team sharing the latest news and rising trends in AI/ML technology-based companies and VC funding and then introducing the five graduating startups – BioVirtua, Endorsify, MeshCandy, RapidMathematix, and trials.ai. 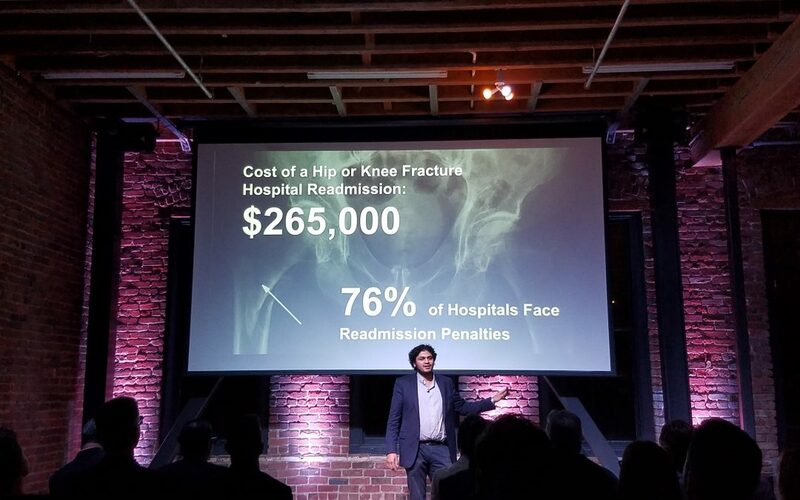 Aashay Tutika, Co-founder, and CEO of BioVirtua showcased how BioVirtua was bridging the largest gap in the healthcare industry, in non-invasive, standardized and remote movement assessment and monitoring — by sequencing human movement using depth-sensing cameras, holographic viewing, and machine intelligence. Aashay demonstrated to the guests how the platform can solve the remote assessment of 100s of conditions that alter human movement such as Parkinson’s, Stroke and Alzheimer’s, and he also shared the company’s success in demonstrating that via partnerships with renowned healthcare institutions like Mount Sinai and Partner’s Healthcare. The guests learned about the founding team’s deep experience and expertise in data analytics, technology, and healthcare, which positions the company for future success. The presentation was received with rounds of applause and it sparked the interest of the guests and investors, who came up to the BioVirtua table to learn more after the presentations were over. The BioVirtua team supplemented the post-presentation discussions with a live demonstration of the product. Guests just walked up to our depth-sensing camera and saw their digitized selfs displayed in our desktop application with real-time joint and movement data, without having to wear any sensor on their person! The evening came to an end with the founders, Nex cubed team and the guests joining in to applaud and celebrate the graduation of the 2017 Fall Cohort over drinks, appetizers, and conversations. BioVirtua thanks the Nex Cubed team for their guidance and support in taking the company to new heights in just a few months and for making the Winter 2018 Showcase a resounding success. We are equally thankful to our esteemed guests who graced us with their presence at the event and gave us a chance to showcase and demo our product. In case we were not able to chat with you or you were unable to join us at the event, we are always available to start a conversation at your convenience! Just send us a message or head over to the BioVirtua website and let us know how we can reach you.